I really wanted to create a new set of free twitter icons since my last set is no longer available. 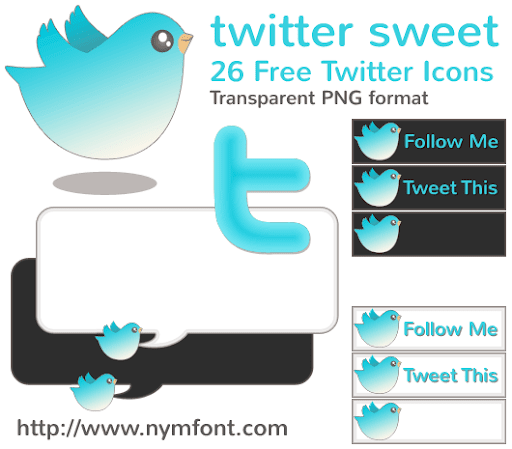 So I created the 26 free twitter icons in the Twitter Sweet set. These icons are free for use in personal as well as commercial projects. Attribution link not required, however if you were planning on re-distributing these icons you must refer downloads to this page and not directly to the download itself. The set includes my own rendition of the Twitter bird in two different color schemes with three sizes each, a Twitter "follow me," Twitter "tweet this," and blank button in light and dark shades, four different Twitter "T" logo icons with three sizes each, and a Twitter tweet stream/status display icon in a light and a dark shade. The icons are in PNG format, transparent when necessary, and are in a zip file. I'd like to re-iterate that these icons are free to use commercially and personally, with no attribution link required. I did draw the twitter bird myself, so please do not claim these icons as your solely own art, and please do not redistribute these icons yourself, but refer downloads to this page please. Thanks! I appreciate your thoughts and feedback on these icons, so please do leave yours in a comment!